I'm in love with the Fibonacci circles on this Zcash chart. The last two times it hit one, it shot up to the top of the trend channel. First it was a 4 day move, then it was a 2 day move. I wonder if it will just be a 1 day move this time. That would be epic. It should start tomorrow, actually it may have started today as we are having an upday so far. 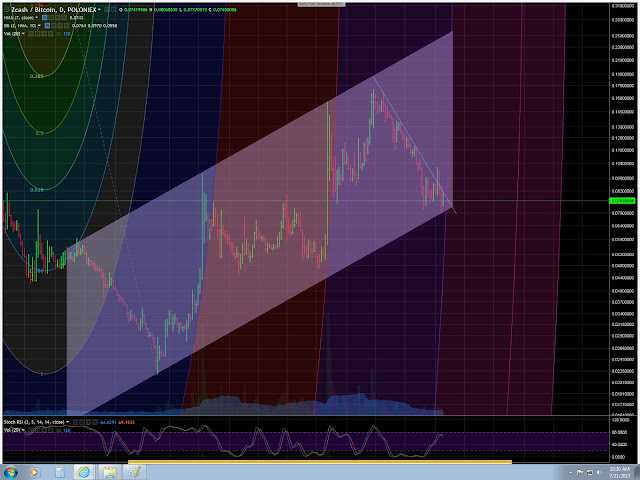 At the same time we are coming up against this downtrend line while being at the bottom of the trend channel. This broke to the downside so I'm outey!